Top-Ranked Notre Dame returns home Sunday afternoon to play Boston College. The Eagles lost to Florida State at home Thursday night 91-71 to drop to 2-3 in the ACC and 13-5 overall. BC averages 77.3 points per game, which is 30th among all NCAA Division 1 teams. They make 43.9% of their field goals and 34.3% of their three-point attempts. The Eagles average 8.3 made threes per game. BC only converts 67% of its free throw attempts. They out-rebound their opponents by an average of 7.8 boards per game. They average 16.8 assists and 16.8 turnovers per game while forcing 19.4 turnovers. The Eagles average 8.6 steals and 3.2 blocks per contest. Emma Guy, a 6’3” junior forward, leads BC in scoring at 13.6 points per game. She shoots 62.8% from the field, but only 65.1% from the line. She averages 7.5 rebounds per game. In the game against the Seminoles, Guy registered a double-double with 24 points and 12 rebounds. Boston College has three other double-figure scorers: Makayla Dickens, a 5.8” freshman guard, averages 11.2 ppg; Taylor Ortlepp, a 5’10” junior guard from Australia, 11.1 ppg; and Marnelle Garraud, a 5’7” freshman guard, 10.2 ppg. Ortlepp leads the team in assists with 68 against 28 turnovers for an assist to turnover ratio of 2.1. Her 45 made threes leads the team. She makes 34.9% of her attempts beyond the arc. Garraud is the team’s best free throw shooter at 85.4%. Georgia Pineau, a 6’1” junior forward from Australia, averages 9.6 points and 6.1 rebounds per game. Two other Eagles average around 20 minutes per game — Taylor Soule, a 5’11” freshman forward, who averages 7.1 points, and Sydney Lowery, a 5’10” sophomore guard, averages 6.4 ppg. The Eagles are a young squad with an incredible eight freshmen on the roster as first-year coach Joanna Bernabei-McNamee focused on bringing in new players to the program. BC has three juniors, two sophomores, and no seniors. In the ACC, BC has narrow wins against Wake Forest (by 1) and Pittsburgh (by 4). The Eagles lost to Georgia Tech by 5, to unbeaten NC State by 16, and by 20 to Florida State. Game time Sunday is 1:00pm Eastern. The game will be streamed on ACCN via the ESPN app. In-game updates will be posted below. Irish Notes: With just 23 points over the past two games, Arike Ogunbowale needs 161 points to pass Beth Cunningham for the second spot among Notre Dame’s all-time top scorers and 196 to surpass the 2,357 points scored by Skylar Diggins-Smith. She’s averaging 16.8 points in ACC play and 21.3 per game for the full season. If she maintains the current ACC average, she’ll move into the number two spot in 10 games vs. Duke at home on February 21st and become ND’s all-time leading scorer two games later in the regular season finale at home against Virginia. 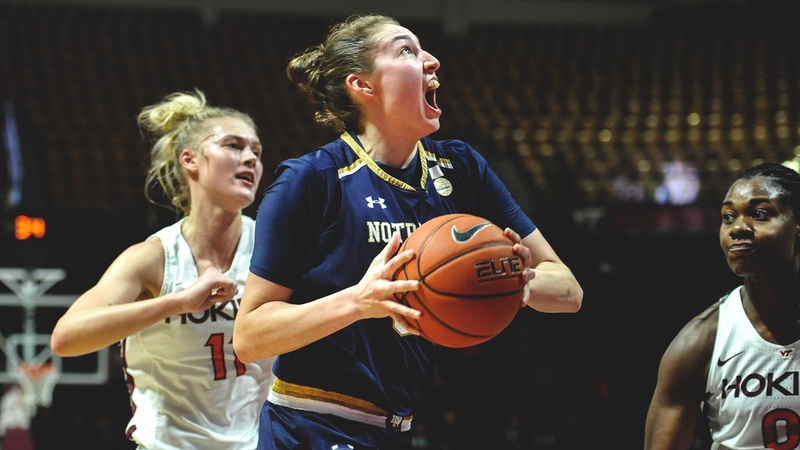 If she can hit her season average the rest of the way, she’ll pass Cunningham at Boston College on February 13th and become ND’s all-time scorer two games later against Duke at home. Jessica Shepard is also nearing a milestone — she needs 36 more points to reach 2,000 in her playing career at Notre Dame and Nebraska. She has already recorded 1,000 rebounds. After collecting 11 rebounds against Virginia Tech Wednesday night, her current total is 1,023. Notre Dame weathered a blistering start by Virginia Tech. The Hokies jumped out to an 11-2 lead in the game’s first 4 minutes. Shepard went to work down low scoring eight and Marina Mabrey added two threes to help the Irish close to within two points at the end of the first quarter. The first quarter outcome marked the fifth time in 18 games that the Irish have trailed at the end of the first quarter this season. Looking across all 72 quarters played to date, the Irish have only ‘lost’ 13 including five fourth quarters when the Irish were coasting to a win: Drake outscored ND by 6 in the final quarter to bring the final margin to 18; Western Kentucky had a three-point advantage to close to within 41 at the end; Lehigh scored one more than ND as the Irish won by 27; Pittsburgh outscored Irish reserves by 5 in a 56 point shellacking; and Wake Forest lost by 30 despite a four-point final quarter edge. In addition to Virginia Tech, the Irish recovered to win three of the games in which the other team had the scoring advantage in the first quarter. DePaul raced to a 7 point lead after one (29-22). The Irish responded with a 14 point advantage in the second quarter (32-18) on their way to a 24 point win. Oregon State led by 12 after one quarter — 29-17. The Irish came back to win by 10. Finally, Marquette outscored ND by one point, before the Irish grabbed a 14 point advantage in the second quarter and won by 24. Notre Dame’s only loss of the season was the only game in which the Irish were outscored in multiple quarters. UConn outscored the Irish by 5 in the first quarter, by 3 in the third quarter and by 12 in the final quarter. This game was the only one in which ND was outscored in the third quarter. ND has been outscored in the second quarter just once all season — a three-point deficit to Louisville. The Irish outscored the Cardinals by 12 in the third quarter to lead by ten points heading into the final quarter. Across all 18 games, Notre Dame has a 4.1 average edge in the first quarter (21.5 - 17.4) and just a 1.1 advantage in the fourth quarter (17.5 - 16.4). Regardless of the first quarter outcome, the Irish usually seize control of the game in the second quarter and build a lead in the third. ND outscores the competition 23.3 to 13.2 in the second quarter and 25.2 to 15.1 in the third quarter. For the season, the Irish have a 25.2 average victory margin with over 20 points of that advantage coming in the middle two quarters.